Confidence shattered after losing a patient, Dr Fliss Knight quit her job in the city and returned to Woodlea where she’d grown up. She bought a run-down farm, just outside the edge of town and started to sort through her life, hoping the calm serenity would help her heal. When her sister and brother in law, Cressy and Denham asked her to let their friend Hewitt Sinclair, lodge in her stables and work odd jobs around her farm while he healed from a motor bike accident, and the loss of his twin brother, Fliss wasn’t sure. But her caring nature saw her agreeing to the few weeks Hewitt would need. Fliss’ doctor side showed when she assessed Hewitt and the obvious pain he was in. But he continued to assure her he was fine. Meantime, Hewitt could see Fliss was hurting, though she covered it well. When a sheepdog was discovered in Fliss’ shed, surrounded by six tiny puppies, their combined goal of caring for the animals and searching for the owners, meant Fliss and Hewitt were together more than each would like. What would be the outcome for these two caring people who had seen tragedy? And what was the secret that Fliss suddenly unearthed? Could she find answers? 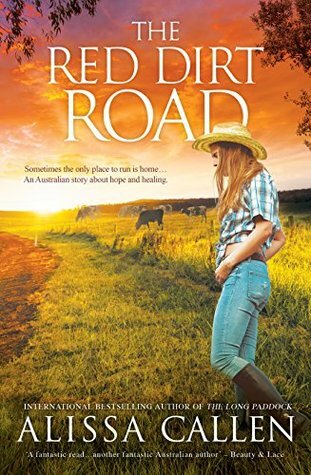 The Red Dirt Road is the 2nd in the Woodlea series by Aussie author Alissa Callen and I thoroughly enjoyed it. I recently read #3 just prior to publication and realized I hadn’t read this one. Now rectified! Set in rural NSW, where instead of drought the rain fell relentlessly, with creeks flooding, and the danger of bridges washing away was high on their list of concerns. The violent thunderstorms are familiar (we had one last night) and the friendliness of locals in a small country town is legendary. (Except for Edna!) An excellent rural romance which I recommend. Sign into Goodreads to see if any of your friends have read The Red Dirt Road.